ASCENT which stands for "Asian Students Collaboration Encouragement Program in Technology" is a student exchange program at the Tokyo Institute of Technology. 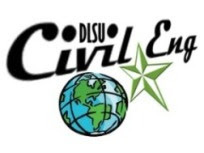 The 6th ASCENT was held last March 13-22, 2015 and BS CIV student Joshua Collado represented DLSU. You can read and download his report about the 6th ASCENT at www.scribd.com. See link below. 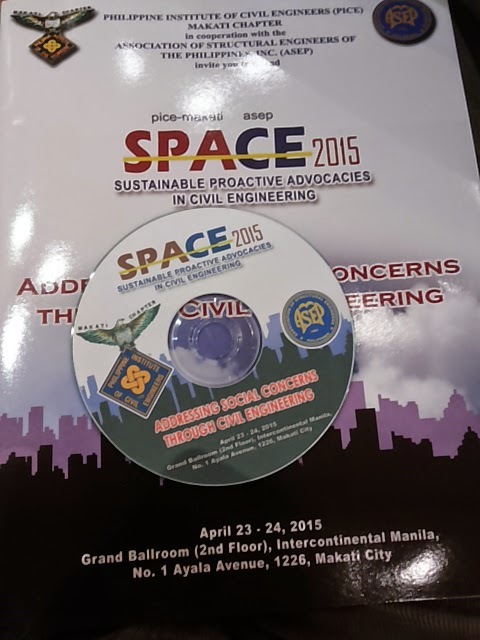 DLSU CE Faculty members presented technical papers at the Conference on Sustainable Proactive Advocacies in Civil Engineering (SPACE 2015) held on April 23-24, 2015 at the Intercontinental Hotel, Makati City. 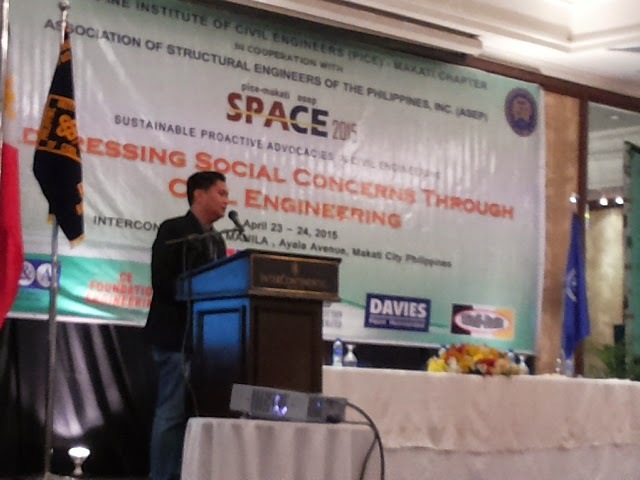 The conference with the theme," Addressing Social Concerns Through Civil Engineering" is hosted by the PICE Makati Chapter in cooperation with the Association of Structural Engineers of the Philippines (ASEP). 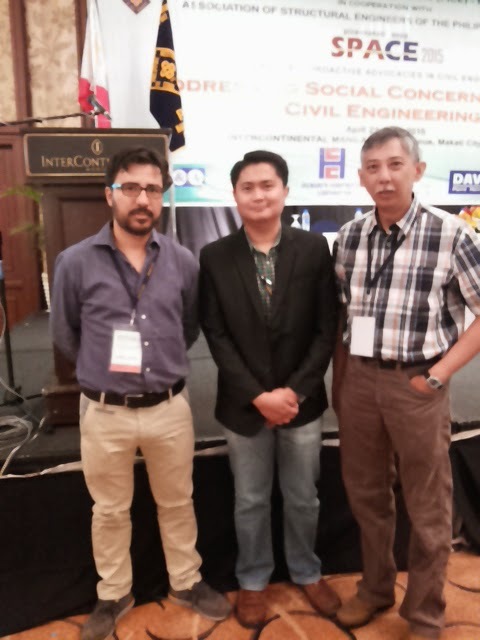 Dr. Lessandro Garciano (STE Division Head) presented the paper co-authored with Dr. Renan Tanhueco (HWR Division) and two Japanese professors on "Risk analysis of power supply due to extreme floods in San Juan, Surigao City, Philippines." The study seeks to identify flood-prone areas in Surigao City and analyze the vulnerability of the power supply system for both residents and power provider due to extreme floods. Dr. Andres Winston Oreta (STE Division) presented the paper on "Mechanical properties in compression of commercially available lumber in Metro Manila." The paper is an output of a research conducted by L. T. Chen, F. Ebanos and M. J. Kung. The study presented the results of laboratory tests on the compressive strength and other mechanical properties of "good lumber" and recommends the allowable stress thay may be used in structural design computations. Engr. Alden Paul Balili (STE Division) presented his paper co-authored with Dr. Garciano on "Derivation of resistance and load factors for new cold formed sections taking into consideration updated wind load models." The paper presents a methodology for determining the resistance and load factors using reliability methods and tools - Monte Carlo Simulation and Rackwitz-Feissler method. Dr. Danilo Terante (HWR Division Head) presented his paper on "Application of fuzzy logic modeling to water resources." The study presents a newly devised water allocation system in prioritization of the different land uses per barangay. 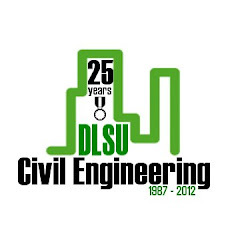 LEGACY (Lasallian Engineers for God and Country) Project is a community extension engagement of DLSU - USG ECG composed of engineering students and faculty advisers. One of the divisions of the GCOE LEGACY Project is the DRRM (Disaster Risk Reduction and Management) Team. This was created in response to the incident in Leyte in 2013 where the super typhoon Yolanda took thousands of lives and caused enormous damage to properties. The focus of the DRRM team is to provide basic assistance to priority communities in Leyte with the help and network of DLSP (De La Salle Philippines) in the form of information, education and campaign (IEC) on disaster risk reduction. With the full support of the CE department chair, Engr. Jason Maximino Ongpeng, a team composed of Dr. Maricel Paringit, Dr. Lessandro Estelito Garciano and Dr. Mario de Leon was tasked to look into the active participation of the department in disaster risk reduction of Barangays San Miguel and Diit. A plan on how the DRR activity will be conducted was formulated. Dr. Paringit generated seven (7) maps consisting of Barangay Diit Administrative Map, Fault Line, Liquefaction Susceptibility, Storm Surge, MGB Flood Susceptibility, MGB Landslide Susceptibility, Waterways and Roads. The maps were made as basis of identifying four specific workshop activities that will be implemented at the two priority communities, to wit; (1) Location of Lifeline Support Structures/Facilities (2) Validation of Position/Location of Waterways and Roads, (3) Validation of Landslide and Flood Susceptibility Data (4) Structural Typologies of Houses and Soil Condition. The DRR activities will be conducted at two sites: (a) Barangay San Miguel located in the Municipality of Dulag, and (b) Barangay Diit in Tacloban City, Leyte. Two visits were already conducted so far at the sites: (a) an ocular inspection to priority recipient communities – 14 Nov 2014 with Dr. Lessandro Garciano and Kirk Yu (CE Student) and (b) DRR and Workshop Activity - 20 Mar 2015 with Dr. Mario De Leon. In the second visit, Dr. De Leon presented the initial findings of the first visit and the activities for the workshop. He gave an overview on the reading and interpreting the maps and the validation of data which are the plans of action that the two communities will have to perform in preparation for the design of their disaster management activities. Dr. De Leon with the GCOE LEGACY DRR Team Head, Mr. Louise Patrick Pambid facilitated the workshop at Barangay San Miguel. Three groups were formed to perform specific tasks, to wit; (1) Location of Lifeline Support Structures/Facilities, (2) Coastline Position Mapping, and (3) Structural Typologies of Houses in Barangay San Miguel. Orientation on the use GPS equipment was introduced to the survey group as well as the filling-out of data sheets. DLSU LEGACY faculty and engineering students assisted the groups’ field activity with the the barangay chairmen of San Miguel and Diit as leader of each group. The first group that conducted the field survey in Barangay San Miguel identified the location coordinates of lifeline support centers which are the barangay hall, school building, chapel and basketball court. These centers serve as evacuation sites of residents in the event of disasters. The task of the second group is to identify structural typologies of house buildings found in the coastal community. There are house structures that are one-story and two-story made of layers of hollow-blocks as wall, with concrete columns and wooden post, and some houses use light materials such as plywood, galvanized iron, nipa and cogon as walls, wooden truss frames and GI sheet as roofing material. The location coordinates of the house structures were also obtained. The structural make-up of the houses is an indicator of its strength to withstand damage due to occurrences of typhoon, earthquake and other disasters. The third group was assigned to perform coastline position mapping with the aid of GPS. There were five (5) points in the beach area where the location coordinates were taken at approximately almost 0.3km in length from a 1km stretch of the coastline. Survey of coastline position determines the extent of its advancement or recession which may have potentials of reaching the areas where the houses are located. On the average, houses are built approximately more than 50 meters from the coastline. The workshop ended with a short presentation of initial findings and results of the field survey. As a concrete manifestation of DLSU CE department’s commitment to community engagement of the priority communities in Leyte, the seven maps were donated to Barangay Diit and was received by their barangay chairmen, Ms Veronica De La Crus, with the intention to use them in their information and education dissemination in their respective barangay and to continue the work on validation of data. The presentation of the maps was witnessed by Dr. Leonila Abella and Dr. Susan Gallardo of DLSU. Follow-up activities will be conducted to complete the workshop activities designed for the two barangays and to introduce DRR management interventions that the two barangays may adopt. DLSU delegates pose for a picture with Engr. Efren Dela Cruz, External Affairs Director of GCOE. From left to right: Siegfried Barrios (BS IE), Kenneth Elevado (BSMS CIV), Engr. Efren Dela Cruz, Isabel Parco (BS MEM), Clarence Co (BSMS CHE) and Abe Lozada (BS MEM). The Faculty of Engineering of Chulalongkorn University hosted the Asian Engineering Student Network (AESN) Camp 2015 last January 19-24, 2015 at Bangkok, Thailand. There were a total of 50 delegates from different Asian countries: Philippines, Hong Kong, Cambodia, Japan, Vietnam, Taiwan, Indonesia, Thailand and Laos. Among those fifty, 10 came from the Philippines –five from both DLSU and UP Diliman. BS-MS in Civil Engineering student Kenneth Elevado along with four other engineering students were chosen to represent the Gokongwei College of Engineering of DLSU. 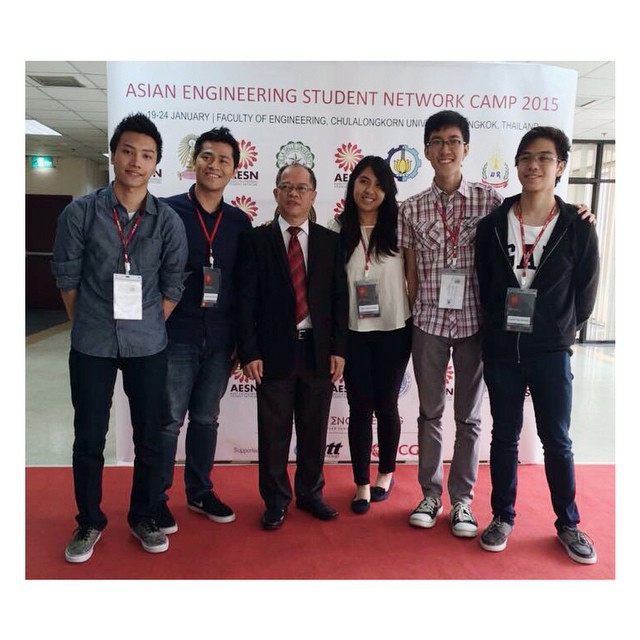 The primary goals of the AESN Camp 2015 were to establish student network among the Asian engineering students in anticipation to the opening of the ASEAN Economic Community this year. Also, the camp was designed to enhance the personal development and the leadership skills of the participants and as well as to provide valuable education and cultural experience for top engineering undergraduate students from Asia and Oceania. Some of the activities of the camp include various lectures regarding Collaboration for Innovation and Education 4.0, Creative Design Thinking and Leadership Workshop, city and cultural tours and a plant visit to SCG. Additionally, the delegates were randomly grouped into eight, which also served as their groupings in the group project. The group project, on the other hand, required each group to present an innovative solution to a certain problem (natural disaster, health problems, waste management, smartphone addiction, transportation problem, waste pollution, energy problem and an accident) using the methodology of creative design thinking. With the informative lectures, creative workshops and innovative presentations, the delegates were challenged to step out of their comfort zone and to interact with the other delegates especially in their preparation for their presentations. The delegates experienced sleepless nights in order to come up with an innovative solution. But beyond those fun and educational activities, the DLSU delegates also had the chance to experience and learn the culture of other Asian countries, develop their leadership and public-relation skills and most importantly, apply the Expected La Sallian Graduate Attributes by being an effective communicator and reflective lifelong learner through socializing and interacting with all the international delegates and valuing the purpose and essence of the camp as well. In addition, the delegates were able to learn how to manage their time wisely especially that only 2 days were allotted for the preparation of their presentations, handle stress, which at the same time developed their well-roundedness, and communicate with other nationalities considering language barrier. Currently, the universities involved in this year’s AESN Camp are planning to conduct such activity annually at different Asian countries. Additionally, they plan to extend their network and include other schools from other countries to expand the connection between these countries considering the opening of the ASEAN Economic Community. In this way, it is believed that more students would have the chance to experience this kind of international event and that the organizers would enhance the activities for a better Asian Engineering Student Network Camp. 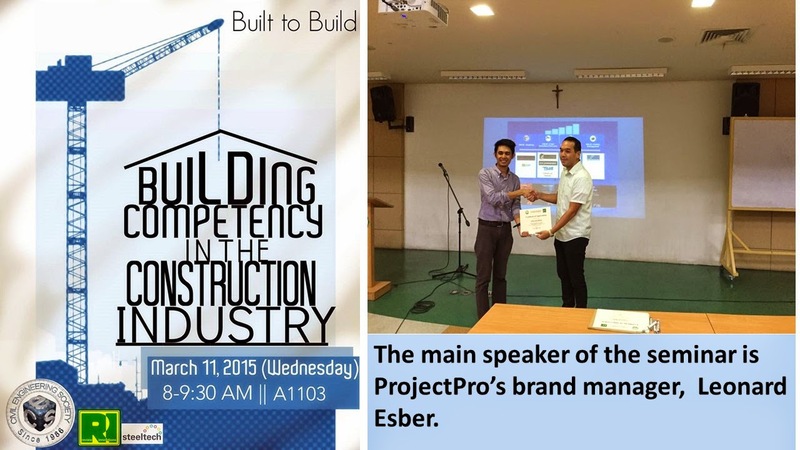 Last March 11, 2015, the Civil Engineering Department and Civil Engineering Society (CES) in partnership with ProjectPro Inc., held a seminar entitled “Building Competency in the Construction Industry.” The seminar aims to increase among students and faculty about the latest tools in Project Management and Cost Estimation. The seminar was attended mostly by CTM major students. 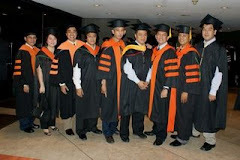 DLSU BS CE alumni who are taking their Masteral degrees in Chulalongkorn University in Thailand were also present. There were also CE faculty present during the seminar, among of which are Engr. Jason Ongpeng (CE Faculty Chairman), Engr. Cheryl Lyne Roxas (CE Faculty Vice Chairman), Dr. Renan Tanhueco, Engr. Irene Ubay-Anongphouth, Engr. Erica Uy and Engr. Joenel Galupino. The main speaker of the seminar is ProjectPro’s brand manager Leonard Esber. He said that the construction industry today is currently at its peak and is one of the largest contributors in the country’s Gross Domestic Product. Therefore, competition among construction firms and property owners becomes tight in order to increase their chances of getting the most out of the high demand for developed properties for all different kinds of occupancies. New technologies that are ventured upon nowadays take advantage on the dawn of construction intelligence through advanced computer systems, programs and machines such as automated structural member models, paperless and digital transactions. One of the technologies that ProjectPro promotes has something to do with Building Information Modelling (BIM) which is also one of the trends in the industry today. BIM is a concept or an idea and not a product. It is a new way of conceptualizing and designing a building along with its other parametric properties. ProjectPro can perform up to 7D analysis. The 3D is the three dimensional image representation of the building. The 4th dimension, or 4D, represents the time aspect. Usability and positioning of the equipment and accessories of the building during construction depends on time. Through 5D, money or cost is involved. The program could show the Bill of Quantities automatically alongside with the building components. This referred to as Digitized Costing. The concept of Digitized Costing is that the computer will configure the scale and quantify construction materials through shape recognition. 6D is the dimension wherein the building life cycle and facilities management is involved. Life cycle maintenance is important to determine if a building can perform through its design life. In this dimension, the technology of mobile access to Defect Liability Period (DLP) is explored. Lastly the 7D is the dimension where the local permits and certifications needed for the different aspects of engineering plans and drawings such as structural, architectural, plumbing, electrical, mechanical, fire protection and auxillary. With all of the remarkable features this software program provides, it does not come cheap. However, investing in ProjectPro or similar software may produce significant benefits to a construction company.